In all honesty this book did not cut out to be as great as I thought it would be. When I had first read the synopsis for Firelight over a year ago I was beyond excited, not only because it sounded like a really cool unique YA paranormal romance, but also because it was about dragons. Who doesn't like dragons? This book was so-so. At times I liked the book and was interested in the plot and characters, but at other times it was dull. The rising action of the book fell right into your run-of-the-mill YA fiction paranormal romance novel. It was almost as if I was reading a remixed version of Twilight; the plot grew unoriginal. Jacinda goes to a new school, falls for the boy that all the girls swoon over but can't have, and he falls for her when he would fall for no one else before. Around that area of the plot I was really annoyed, because with the unique concept of this book (dragons, and shape-shifting humans) it could have been more original. The relationship between Jacinda and her sister Tamra, however, was something I was interested in. It reminded me a lot of my own relationship with my younger sister; not perfect, rocky more often than stable, and in that aspect I could relate to Jacinda. Plot was something else I had a bit of a problem with. Some scenes would drag on and on with sometimes dull and boring dialogues and scenarios. While on the other hand, towards the last third of the book everything was happening so fast. Throughout Firelight scenes seemed to jump at wrong parts in the novel while droning on in others. 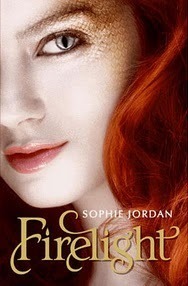 I had really expected more of Firelight, maybe I had gotten my hopes up too high for this book, but it wasn't bad. I'm thinking about reading the next book in the Firelight series, because who knows maybe it might be a lot better. I hope so with that cliff-hanger.